Let’s Get Real. Is the Good News Good Enough for Us? I’ve repented and been forgiven, but I still feel a wave of shame when I remember how I treated my parents on my 7th birthday. My parents were broke. Dad was a musician who played every gig he could in the evenings and went door-to-door asking for work during the day. Mom waited tables and did as many odd jobs as she could to keep food on the table. Still, money was so tight that weekends were full of prayer…prayer that the check mom wrote for groceries on Friday would be backed by real money on Monday when the bank paid attention to it. Somehow, for my 7th birthday, my parents scraped together enough extra money to buy a beautiful, brand-new Schwinn bike—fully equipped with colorful banana seat and handle-bar streamers. They were so excited to give me that gift. The cost was worth it to them. The day finally came for me to open the gift, and now that I’m a parent, it’s not hard to imagine the anticipation my parents must have felt awaiting the ecstatic tears of joy they knew would surely flow. And flow they did. For a couple of minutes. I was genuinely thrilled when I saw that bike. I had never owned a two-wheeler, and it was gorgeous. I didn’t know how to ride it which was a concern, but dad guaranteed he’d have me riding like a champ no problem. After that agreement was made and I thanked my parents, my eyes immediately began to search the room for the rest of my gifts. After all, who gets only one gift for her birthday? I can still see the look of pain in my parents’ eyes as their hearts were crushed. All those blisters on my dad’s hands from raking extra leaves…I didn’t see those. All the late-night closing shifts my mom had worked despite her migraine headaches and back pain…not a concern of mine. Thankfully my parents did exactly what they should have done. They took that bike back to the store and left me with nothing. Ironically, only one week later I taught myself how to ride a neighbor’s two-wheeler and ached to have my beautiful bike back. Eventually, I did…after I raked enough leaves to pay for it myself. It would have been so much better if I’d just been thankful for the sacrificial gift purchased just for me. But we all know the cliché…hind sight is 20/20. Is this all I get, God? Fast-forward 40 or so years and increase the stakes…a lot. The gift is not a bike, it’s the Cross of Christ. A sacrificial gift with a cost so high I can’t describe it. Given to me...and you…freely. The benefit is far greater than having a sporty mode of transportation. The benefit is that a broken and dirty 21 year-old me who had sabotaged every meaningful relationship in my life…who found myself clothed in head-to-toe shame crying alone in the dark for days wondering why I should keep living…was miraculously scooped up by Love indescribable, given a safe place in which to confess my many sins, repent, and be forgiven…and given a reason to live. A Person to live for…who wasn’t disgusted or ashamed to love me. Jesus took off my cloak of shame and replaced it with His own sparkling white robe of righteousness. It was as if He said, Cover yourself with this. You’re safe hidden under here…forever. For me, it was a Damascus Road experience of sorts. My life was transformed big time. I lost all desire to work in a bar, to smoke, to drink, even to cuss (which had been my second language). All this happened before I ever set foot in a church. It was Jesus and me. It was me undone by the gift He died on the Cross in my place to offer: cleansing, forgiveness, purpose, and eternal life. The penal, substitutionary atonement of Jesus had saved me. I experienced the power of the Gospel—the Gospel Paul and the Apostles preached. That was the Good News. Jesus was the hoped-for Messiah, come to save God’s people once and for all…come to reconcile God’s children to Himself as the final and sufficient payment for all sins. The death, burial, and resurrection of Jesus was the Good News. Period. And many were added to the church when this message was preached. And many went to their deaths defending that message. Is the Good News good enough for us? we never feel God again? loved ones we’ve anguished over in prayer never get healed this side of heaven? we discover that Bible teachers (several of them) we’ve respected and trusted for years are abusers? we discover doctrines we’ve held dear and thought everyone else believed (such as age of the earth or end times or women in ministry or supernatural gifts or you name it…) are highly contested issues amongst reputable, Jesus-loving scholars? the doors (even ministry doors) we felt sure would open all stay tightly closed? daily life is mundane and confusing and hard? Christians we thought truly cared about us wound and abandon us? Will we remain faithful to Jesus even if the only New Testament promises we can count on are tribulation and persecution? Is the Cross + persecution + eternal life enough? Or will we be easy pickins for the deceiver? Will we give up on Jesus because He’s not doing things the way we would if we were in charge? Or because we don’t like some of His words or ways? You don’t have to search any farther than Facebook or Twitter to see attacks on everything Christians have held sacred from the reliability of the Bible to the legitimacy of the local church. And who can miss all the reports of abusive pastors and leaders? They come regularly now. It can all be so disheartening. It can lead to massive doubt and disillusionment. Will we doubt toward God or away from Him? Will we do everything in our power to find God true and faithful in our search for answers? Will we hold sound doctrine close, or will we throw our Bibles in the trash the moment a few intellectual and kind skeptics send contradictory claims our way? In which direction will we throw our full weight? I honestly think our answer has a lot to do with how good the Good News is to us…with what the Cross means to us personally. Transparently…sometimes the only thing keeping me from throwing in the towel is the death, burial, and resurrection of Jesus. It’s the one series of historical events that makes sense out of my crazy life and this messed up world. It’s what gives me hope and worth and meaning. I won’t let go without a massive fight. The stakes are far too high. I pray daily that I will never let go. I believe, Lord. Help my unbelief. I want nothing more than to be counted among the few who find the narrow way (Mathew 7:13). I know first-hand what the broad way offers. I’ll bet you do, too. Nothing but purposeless, empty life followed by meaningless death followed by nothing. And even though our Heavenly Father does bless us with far more than we’ll ever know…I believe we must have the kind of faith that can survive a severe drought and weather all kinds of storms. Even the ones that seem endless. So…is the Good News good enough for me? Is it good enough for you? It’s a question we cannot avoid. Yes, Lord. 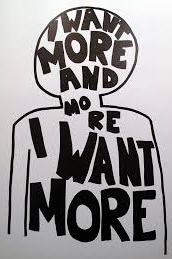 It is more than enough. And please help us stay faithful to that answer no matter the cost.